Garnier finally launched its BB Cream in India last weekend and when I spotted it in the beauty centre I immediately picked it up! This is my first BB Cream (yeah I didn’t try the Maybelline one! ), do read on to know my experience. Tired of lugging around a hundred different products for your skin or having to pick and prioritise the products most important to you? Leave it all behind as Garnier introduces the BB cream, Beauty Benefit Cream – an all in one daily moisturiser which is the perfect solution to all your skin care problems. Everything you need for instantly perfect looking skin is now in one cream. The Garnier BB Cream is a miracle skin perfector that gives you perfect skin – instantly! I have been thinking to buy Maybelline BB Cream for months but somehow I never got it and a few weeks back when I read Garnier is launching its BB Cream in India, I decided to skip the Maybelline one and wait for Garnier’s version. I have read some great reviews on Garnier BB Cream and I must say it completely lived upto my expectations. Garnier BB Cream comes in a tube packaging with tiny nozzle dispenser which give effective and gives control over the quantity to be dispensed. The outer box contains lots of information as to what is BB Cream, how to use it and what it does to your skin; which is indeed very informative as BB Cream concept is still fresh in India. I guess few brands like Maybelline, Pond’s (discontinued) & most recently TBS are few ones available in Indian market. Unlike Maybelline, this BB cream comes only in one variant; it does not have any option to chose from according to your skin tone (I checked with the SA twice to make sure they don’t have any variant, neither anything is mentioned on the box) and I was not sure if it would match my skin tone well (Dry to normal – Light skin tone) but I was surprised when I used it; it instantly got adjusted to my skin color & gave a dewy & glow-y finish. The texture of the cream is light and looks like a concealer – color wise and it spreads very easily on my skin. Since, this cream is all in one – moisturizer, sunscreen, foundation, concealer etc I skipped all the skin routine steps! It is truly a great product when you are running out of time or when you are too lazy to apply everything on the face or your hubby’s is waiting for your makeup to get over! 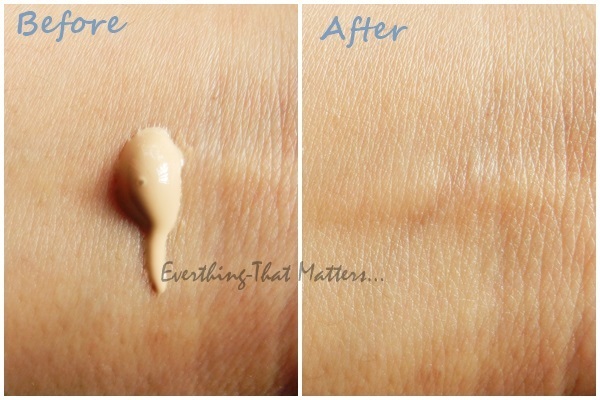 It lightens the blemishes to an extent but it does not cover up like a concealer does. It is good option for everyday use and for college going gals. I stepped out for 6 hours after applying this and it kept my face looking fresh throughout which is great! In indoors, I am sure its 8 hours claim can be achieved. One thing that irritated me about this product is its fragrance – its too flowery and little artificial to my liking but it fades away after a while; again fragrance is a personal choice! Recommendation: Garnier BB Cream is all in one cream and it is very easy to use and if you are a gal for whom less is more then you will definitely love this product. And if you want to sometime cheat and skip a few steps of your makeup routine then also you will equally love it!